The ability to borrow from your 401k is a safety net. Like most safety nets, ideally you never use it, and you get comfort out of knowing it’s there. But you may reach the point where a 401k loan is the only option you’ve got. If you’re at that point, take some time to understand the process, the timeline, and the potential risks before you move forward. If you just want the quick version, the process is listed below, with complete details farther down. To get started, tell your employer that you want to borrow from your 401k. Contact your HR department or benefits manager and request a loan from your 401k. Verify that loans are allowed in your plan, and find out how you’ll need to repay. Complete a loan request application (either online or by paper) and submit. Repay the loan through payroll deduction and/or a lump sum. In the past, this was all done with paper forms, but it’s increasingly common to request loans online. You may be able to just log in to your 401k account and make the request. The process takes anywhere from a day (especially if you do it online) to several weeks (because several different people may need to sign off on your request). If you need funds, find out as soon as possible how long turnaround times typically are. Your HR or benefits contact is the best person to ask. Somebody at your employer needs to approve the loan (typically the Trustee or a Plan Administrator). An administrator (possibly a third-party administrator or TPA) needs to verify that loans are allowed and that your loan will not cause any problems. If time is of the essence, look for options to receive the money electronically. Direct deposit or a wire transfer into your account will save time waiting on the mail, and you won’t need to deposit the check into your bank account (which can add another day, depending on when you make the deposit). Plus, you won’t have to wait as long for the funds to clear if you receive an electronic transfer. With direct deposit, the transfer itself should take two to three days, but the loan still needs to be approved before the funds are released. Costs depend on your plan, but you might expect to pay about $100 up front, and another $50 per year for administration. That money is deducted from your account, so you don’t have to write a check. The real costs are the risks you take when taking out the loan: that you won’t pay it back before you quit working, and that you lose out on the opportunity to participate in market gains (if your investments would have earned money). Can You Borrow From Your 401k? Plan offerings: Before you count on a loan, verify that you actually can borrow from your 401k under your plan’s rules. 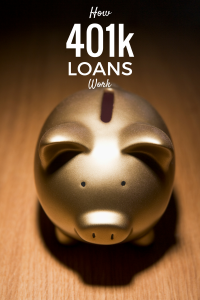 Not every plan allows loans — it’s just an option that some employers offer — and there’s no requirement that says 401k plans need to have loans. Some companies prefer not to. Employers might want to discourage (or prevent) employees from raiding their retirement savings, or they may have other reasons. For example, they don’t feel like processing loan requests and repayments. How do you find out if you can borrow from your 401k plan? Ask your employer, or read through your plan’s Summary Plan Description (SPD). If loans are not allowed, there might be other ways to get money out. Former employees: 401k loans are generally only allowed while you’re still employed. If you no longer work for the company, you’d have to take a distribution from the plan instead. Former employees don’t have any way to repay the loan: You can’t make payments through payroll deduction because you’re not on the payroll any more. In most cases, you’re allowed to borrow up to half of your account balance, or $50,000 — whichever is less. So, if you have $40,000 in your 401k, you should be able to borrow up to $20,000. If you have $200,000 in your account, you’d only be able to borrow up to the maximum $50,000. Be sure to only consider your “vested” account balance. You can’t borrow against funds that your company contributed on your behalf if you don’t yet have full rights to that money. It’s best to borrow as little as possible. You’ll have to repay that loan, and smaller loans are easier to repay. Borrowing is always risky, and borrowing from a retirement plan is especially risky, as you’ll see below. However, you might only get one shot at borrowing, so you might not be able to borrow more if you need it in the future. That is, you might only be allowed to have one loan outstanding at a time, and there are some other intricacies that limit how much you can borrow if you’ve borrowed from your 401k plan in the recent past. Since you’re borrowing from your 401k plan, you have to repay the loan. This is typically done by taking a portion of each paycheck and applying it toward your loan. In most cases, you can borrow for a term of up to five years, but longer-term loans may be allowed if you’ll use the money to buy your home. Again, borrowing is risky, and longer-term loans are riskier than shorter-term loans (it’s hard enough to predict the future five years out, but it’s virtually impossible to imagine what things will look like in 10 or 20 years). When you repay money that you’ve borrowed from your 401k plan, you don’t get any tax benefits. That money is treated as normal taxable income to you, so it won’t be like any pre-tax contributions that you’ve been making to the plan. You can still contribute to the plan with pre-tax dollars (and/or make Roth 401k contributions if your plan allows) but you don’t get to double-dip and get a tax break on loan repayments. Remember: You weren’t taxed on the money you received when you took the loan. If you leave your job (voluntarily or not) before you repay the loan, you should have an opportunity to repay any money you borrowed from the 401k. But that’s not always easy. You probably took the loan because you needed cash, and it’s therefore unlikely that you have a lot of extra money sitting around. Try to repay if possible, otherwise, you may face income taxes and tax penalties as described below. If you’ve been recruited to a new job, you might be able to get some help from your new employer (they might pay off your loan balance). As with any loan, you pay interest when you borrow from your 401k. Fortunately, the interest goes to your own account, so it’s a form of earnings for you. Some people assume this means that borrowing from your 401k plan is free of any drawbacks — after all, you’re paying yourself instead of some greedy bank. While it’s true that you get some benefit from the loan, there are also drawbacks. First, you’re taking the risk that you won’t repay the loan. You also miss out on the opportunity to earn more than you’re paying yourself in interest. The interest rate is relatively low (it’s often based on the “prime rate,” with one percent added), but you have the potential to earn more in the markets if you’re willing and able to take risks. On the other hand, you might come out ahead if you borrow from your 401k plan just before the markets crash. You don’t necessarily have to repay 401k loans, but you’ll probably owe taxes and penalties if you don’t. When it’s been decided that you’re going to “default” on the loan (because you permanently stop making loan payments out of your paycheck for any reason), your loan becomes a distribution. It goes from being a temporary thing to a permanent thing — you can’t put the money back in the plan (unless you want to try and get fancy, and do a rollover within 60 days of “distribution” — talk with your tax preparer before you even consider this). If the money was pre-tax money, you’ll owe income tax on everything that has not been repaid, and you will likely also owe a 10 percent penalty on that amount. Assuming you owe $10,000 and your tax rate is 20 percent, you’d owe $2,000 of income tax plus an additional $1,000 of penalty tax. Loan offset: You may be able to pay off a loan by depositing funds in an IRA or another retirement account. To do so, you must make the rollover contribution before your tax filing deadline plus extensions (the Tax Cuts and Jobs Act extended the original 60-day period). To use this strategy, you typically must have ended employment, or your employer may have terminated the 401k plan before you could repay the loan. Again, verify everything with your CPA before taking action. In addition to taxes and returns, there are other reasons to avoid taking money out of a 401k plan. Especially if you’re going to pay off debt, you give up some important benefits of your 401k plan when you take money out of it. Do You Need to Get Approved? The process of getting approved for a 401k loan is different from using a lender like a bank or credit union. Your employer does not evaluate your credit scores (or history), your income, or your ability to repay the loan. As long as your plan allows loans and you can meet the requirements, you can borrow. You don’t need to apply — you just request the loan. Bad credit, bankruptcy, and other negative items in your credit do not prevent you from borrowing. Again, you can use the money for anything you want (unless you want a longer term loan, which may only be available for the purchase of a primary residence). Still, it only makes sense to raid your retirement savings if you have a good reason. Don’t use loans to fund “wants.” If you absolutely need the money for your current living expenses, it’ll be hard to replace that money later. Your credit is not affected if you fail to repay a 401k loan. However, you may have other financial issues to deal with (like income tax and the additional penalty tax). If you previously borrowed from a 401k and you need to borrow more, your plan will dictate what your options are. Plans often allow both “general purpose” loans (which can be used for anything) and principal residence loans, so buying a home can provide additional borrowing capacity. Plans that only allow one loan at a time often allow you to repay and borrow again without any waiting period. However, the maximum amount you can borrow might be reduced by your loan balance in the previous 12 months. For example, if your account balance is $50,000, you would be allowed to borrow up to $25,000. But if you had a loan balance of $4,000 within the past 12 months, your maximum available loan amount may be reduced to $21,000. If you’re able to wait for the 12 month period to pass (where you have no loan balance for 12 continuous months), you’d be able to borrow the full $25,000. The process of borrowing for your primary residence is similar to the process described above: Verify that loans are available, and request a loan through your employer. The main difference is that you will need to provide documentation that the funds are being used for the purchase of your primary residence. The requirements depend on your employer’s rules. A residential sales contract (or purchase and sale agreement) is often sufficient, but ask your employer for details before you apply. Residential loans can be repaid over a period up to 30 years. However, employers don’t necessarily have to offer the full 30 years (most employees are not going to be around for 30 years, so shorter periods — like 15 years — reduce problems for everybody). You can always repay early, but if you want smaller monthly payments, a longer loan repayment period is always an option. If you get a residential loan, your plan’s administrator should automatically adjust the repayment period to result in lower monthly payments when setting up the loan. Ask for an amortization schedule at the beginning of your loan so that you see a year-by-year (or month-by-month) breakdown of your payments and interest costs.